What good is a new expansion to the world's largest grand strategy game without fancy new units, music and portraits? 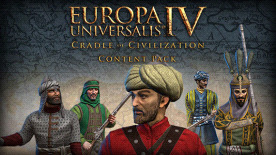 Paradox Development Studio has prepared a host of cosmetic content for Cradle of Civilization, the newest expansion for Europa Universalis IV, adding even more ambience and character for your campaigns of trade and conquest in the Middle East. New military unit models for the powers of the Arabian Peninsula (Oman, Yemen, Najd and Hedjaz). New military unit models for the major cultures of West and Central Asia (Persians, Afghans, Kurds, and Tabaristanis).